I have been searching for the perfect book subscription box for almost a year. See the problem is that even though Lexi’s reading level (and Lexile level) is at mid 4th grade (last time she was tested about 4 months ago), she does not choose reading as her preferred activity. 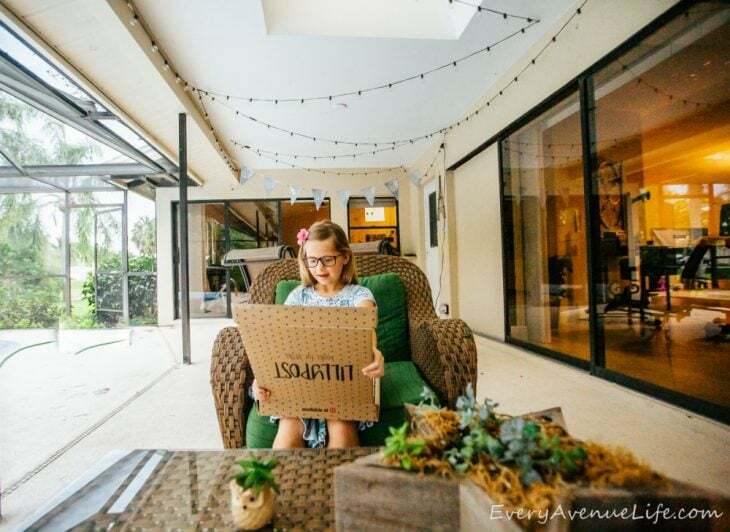 She seems to be more of a visual and artsy kid than a bookwormy kid, despite her love for new knowledge (which she prefers attaining through watching and listening rather than reading). So when it comes to books, even though her level is well at chapter books, her interest is still at beautifully illustrated books (and to be fair, so is mine, I am a sucker for illustrated storybooks). 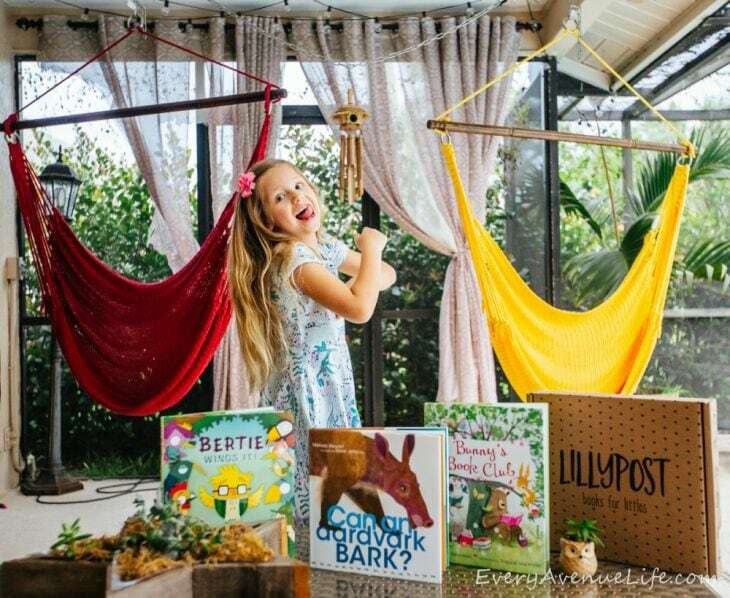 So after trying more than one book subscription box and mainly receiving chapter books that she did not have the attention span or interest in, which could be due to the fact that we barely have quiet time at home with all the activities we do), I unsubscribed from all of them. 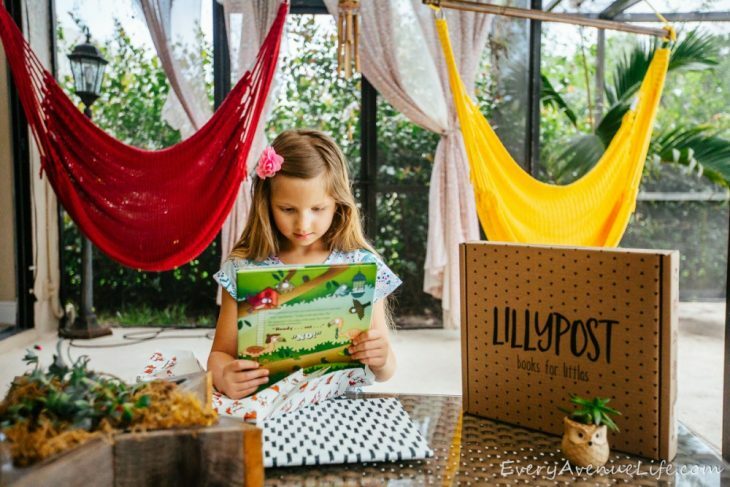 Lillypost is a children’s book subscription box. 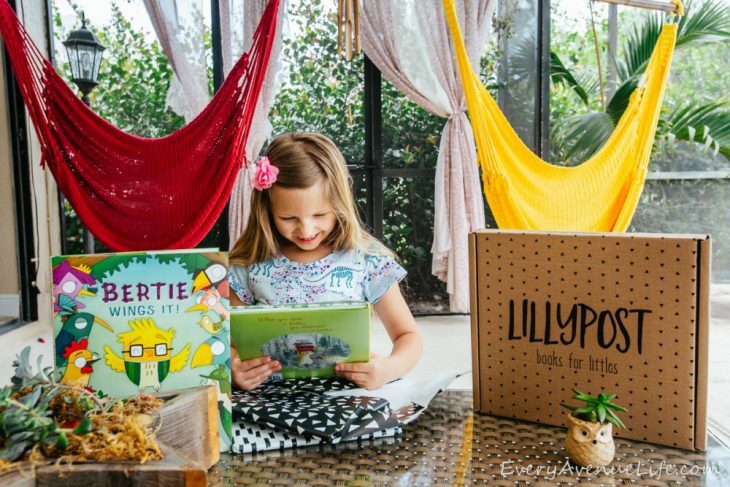 Each month your little one will receive three to four books right to your doorstep. 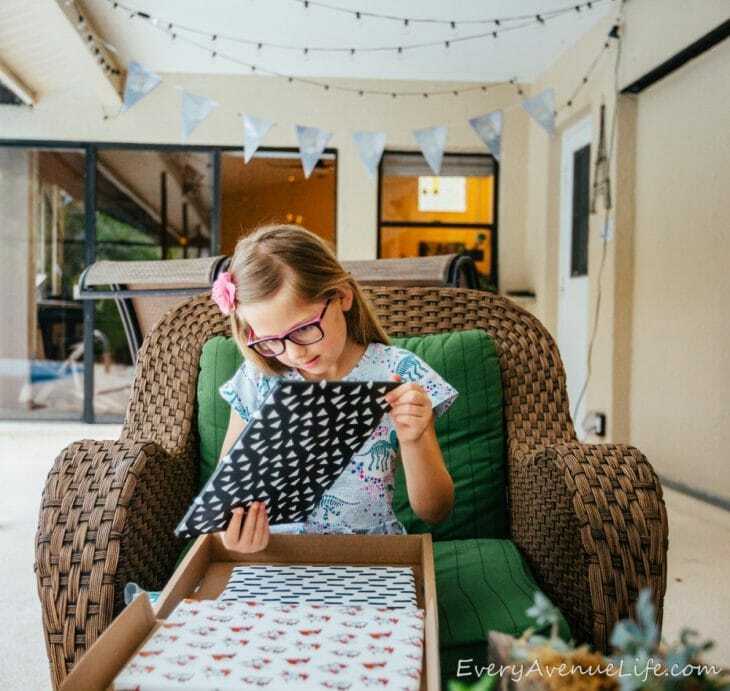 All kids love getting mail and a box that is created just for them with new stories each month is such a wonderful surprise. We received a beautifully illustrated book about a bird who wanted to fly, yet everyone around seemed to want to give him their own advice without first hand experience, another one about a book club, after which Alexis exclaimed “I want to do a book club, we have a ton of books, so we can do it!” (mommy is a bit of a book hoarder!). The third book was questioning whether an Aadvark could bark! (You need to read it to find out!). 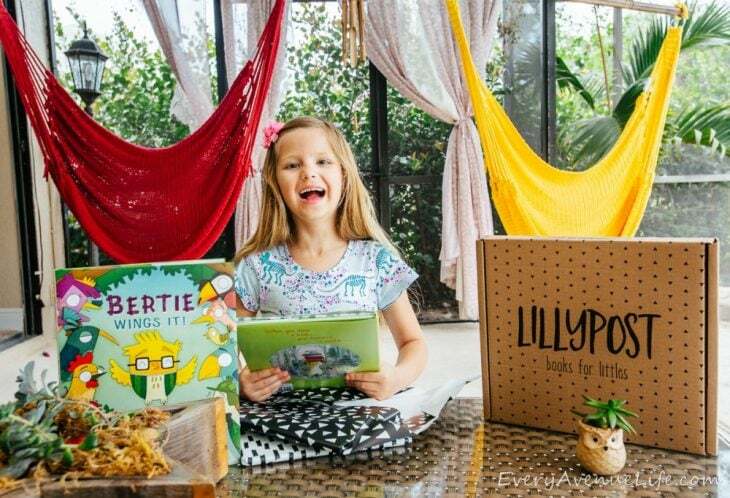 Lillypost also gives back- for every box delivered they give a book to a child in need. 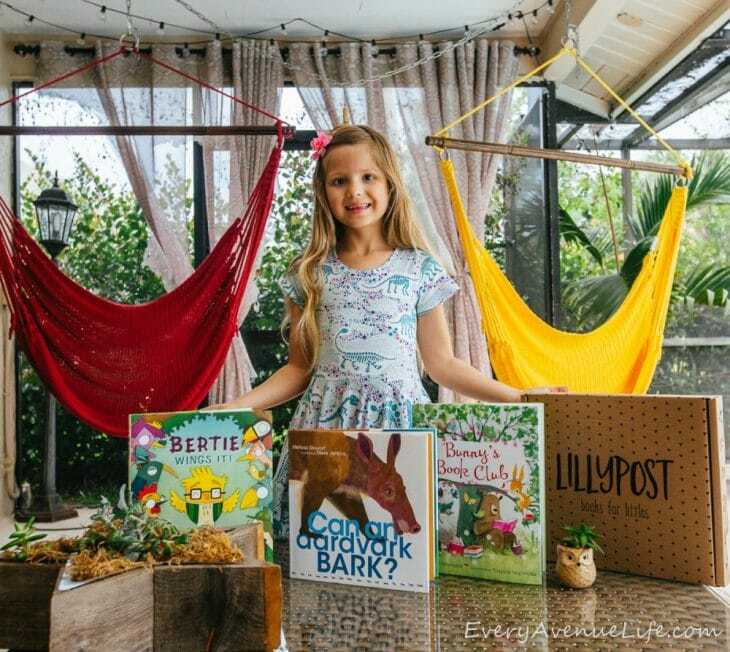 So far, over 50,000 books have been donated through Lillypost. Which is a wonderful lesson to teach children and hopefully they could use it as an example (by the way, does anyone know the best place to donate books to?). The boxes are curated for ages newborn up to age 7. 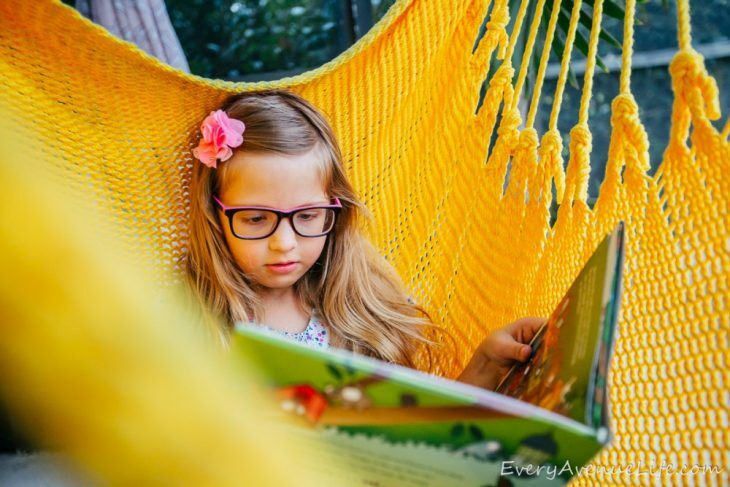 There are three different options for the types of books: board books for ages 0 to 3, picture books for ages 4 to 7, or a mix of board and pictures books for all ages. 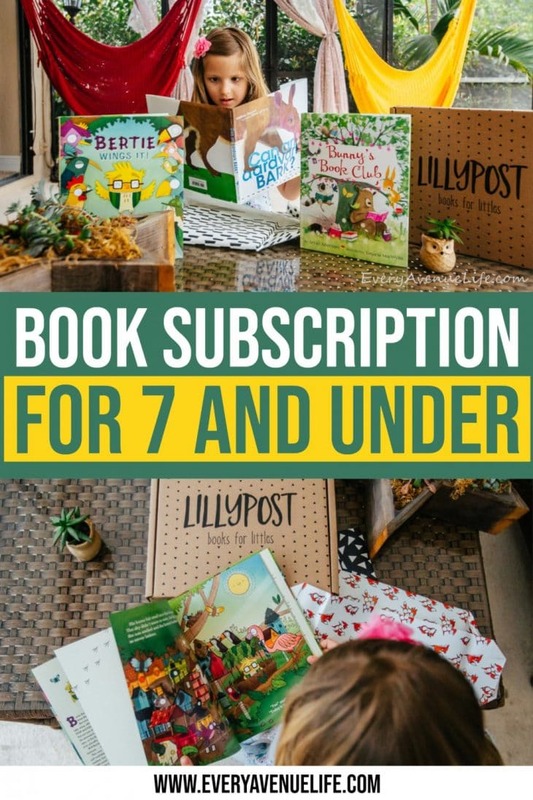 You can choose different monthly options for your book subscription box including 1 month, 3 months, 6 months, or 12 months. The longer your subscription to more you save. These books are up to 50% off the retail price. This is a great option for birthday or holiday gifts for kids. 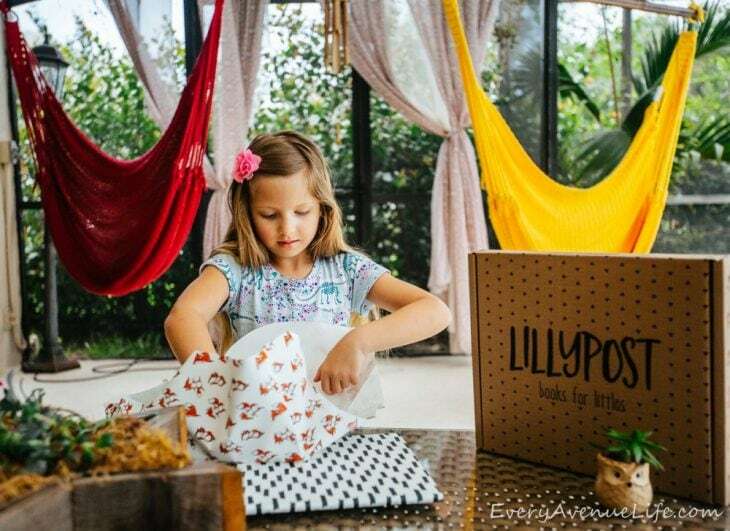 Instead of typical toys and games, parents, grandparents, family, and friends can order a Lillypost book subscription box. Books are classic and timeless, and it is truly a gift that keeps on giving- not only being able to have a “gift” that comes throughout the year but also having brand new books that they can read over and over. 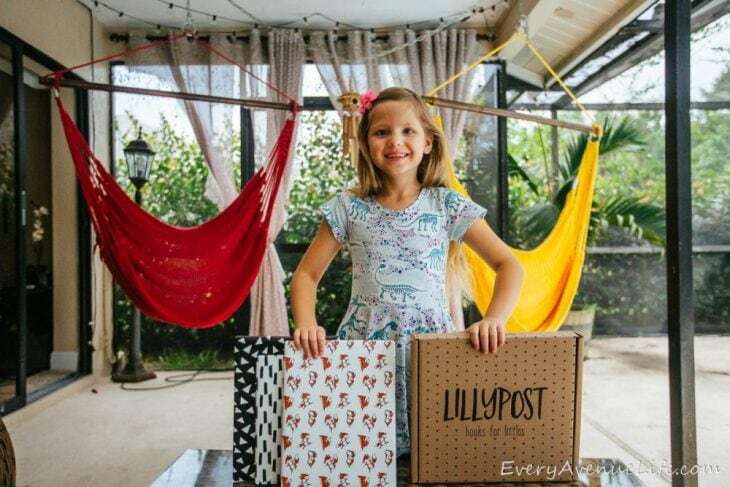 Lillypost is a highly giftable item and gift-wrapping is available at $5USD/$6CANper box. Another great thing is that they pick the books for you- no more trying to search for great books for your kids. They take the guess work out of finding new and engaging stories for your little ones. You also can find books that you never would have discovered. 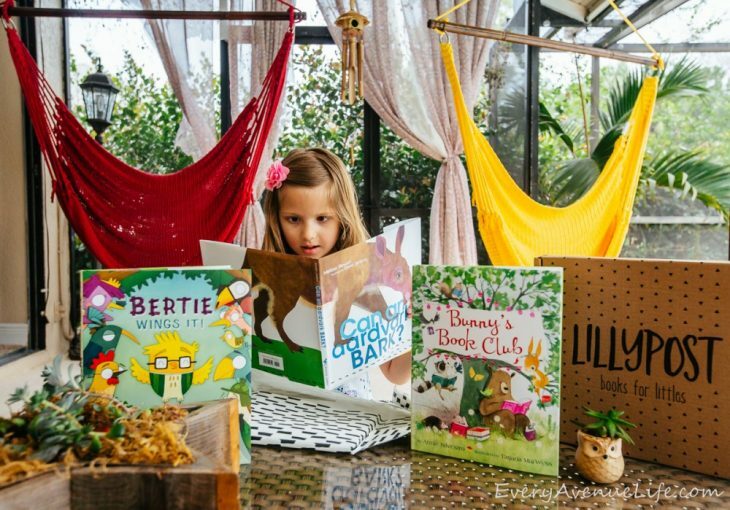 Books are a great way to bond and spend time with your child. 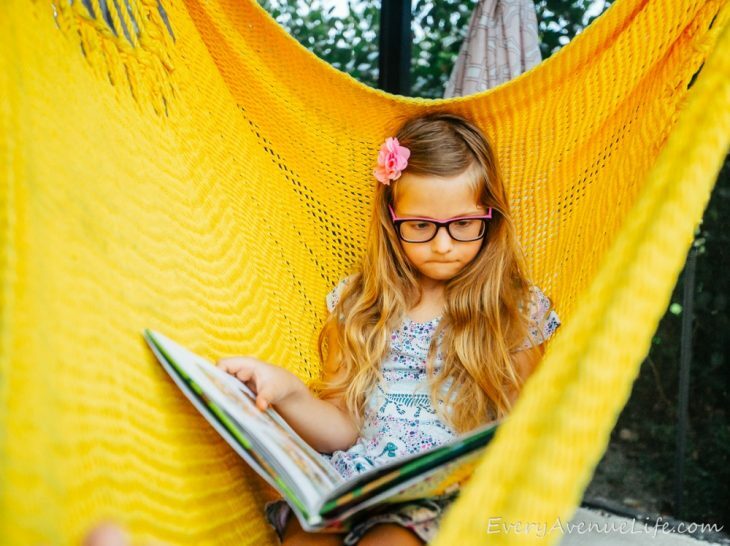 Research has shown that reading to your child every night is great for their academic and social-emotional development. 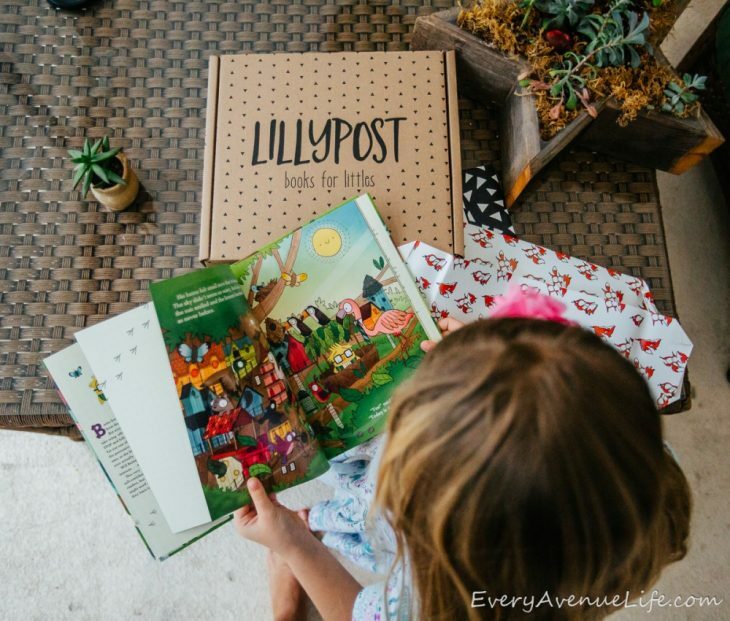 With brand new books coming to your door every month with Lillypost it will be easy to continue that special time of reading together as a family. 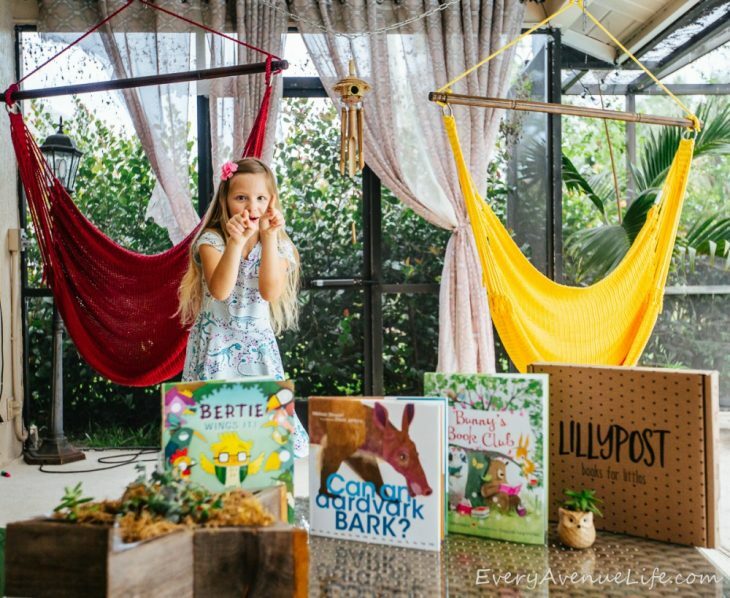 Opening a box contained three wrapped presents in a form of beautiful books was exciting and the books were so gorgeous and fun that she read all three books the same day! Unprompted. 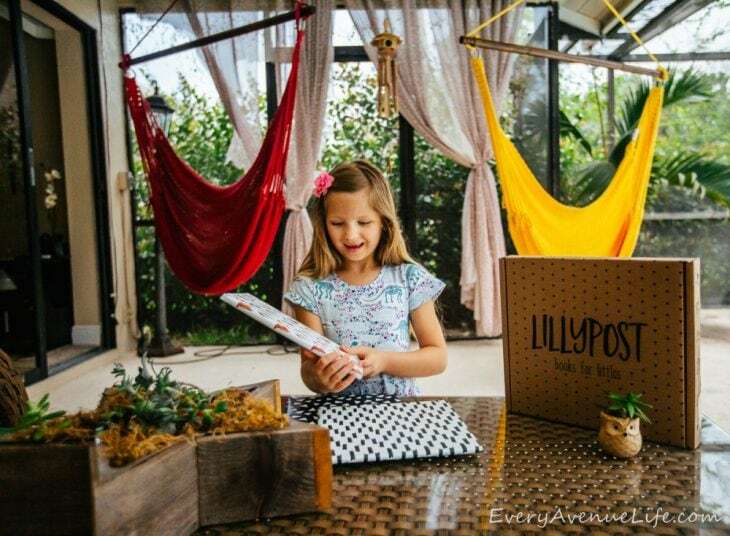 Now if only Lillypost would offer daily delivery subscription!